A Good Birth, A Safe Birth covers the pros and cons of today's childbirth options and helps the expectant mother plan each stage of her pregnancy and delivery. It offers tips on how to find the right doctor or midwife - and how to avoid the wrong one. It explores the various childbirth environments, including hospital, birthing center, and home. It tells expectant parents how to ensure that their wishes will be followed. The benefits and drawbacks of medications and painkillers are also discussed, so that a mother can decide before her delivery, which, if any, medications are right for her. 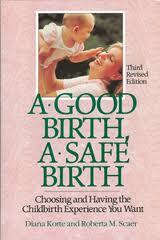 A Good Birth, A Safe Birth enables the mother to regain control of her birth experience.